Composer, violinist, and writer on music. Received his education from the Jesuits in Augsburg, first at the Gymnasium (from 1727), then at the Lyceum (from 1735). After the death of his father, he entered the Benedictine university in Salzburg (in 1737); he was expelled two years later for excessive absences. 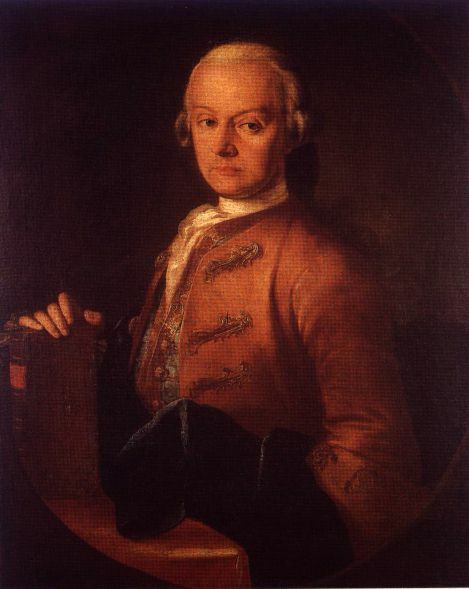 He took a post as house musician for the Count of Thurn-Valsassina und Taxis in Salzburg; during this period he published his first compositions, a set of six trio sonatas. He was appointed violinist to the Salzburg court chapel in 1743, and by 1763 had advanced to the position of Vice-Kapellmeister. His two surviving children, Maria Anna ("Nannerl") and Wolfgang Amadeus, were born to him and his wife Anna Maria (née Pertl) in 1751 and 1756, respectively. Also in 1756 Leopold published his Versuch einer gründlichen Violinschule (Augsburg, 1756; expanded ed., 1770; 3rd rev. ed., 1787); translated almost immediately into Dutch and French, it was one of the most significant and widely used treatises of the second half of the 18th century. 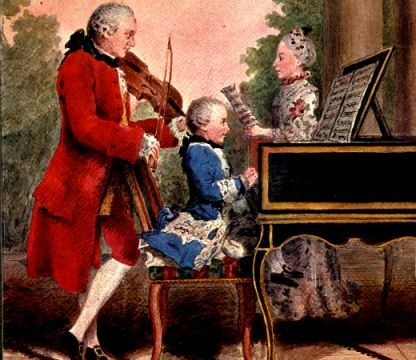 After about 1760 Leopold devoted much of his energy to his children's musical education. Both Wolfgang and Nannerl were prodigies on the clavier, and beginning in 1762 Leopold took them on extensive, exhausting tours of the major musical centers of Europe. Though he is often criticized as an exploiter of his own children, Leopold felt it his mission to reveal to the world the "miracle that God allowed to be born in Salzburg." He must be given credit for giving his son a broad exposure to international musical styles, which was later to prove essential to his musical development. He took Wolfgang on tours of Austria, Germany, Holland, England, and France; he also served as the boy's stringent teacher of counterpoint and composition. After Wolfgang settled in Vienna, his father's time was increasingly occupied with teaching. Father and son became distant; Leopold made his last trip to Vienna in 1785 and died only partially satisfied with Wolfgang's successes. Among Leopold's own extensive oeuvre is a large number of sacred works (cantatas, oratorios, Masses, litanies, Magnificats, Psalms); many symphonies (a number of which have occasionally been attributed to Wolfgang), including the Symphony in D (De gustibus non est disputandum) and the Symphony in G (Sinfonia da caccia); serenades and divertimentos (incl. "Die Bauernhochzeit." D major, and "Die musikalische Schlittenfahrt," F major); concertos; chamber and keyboard music.